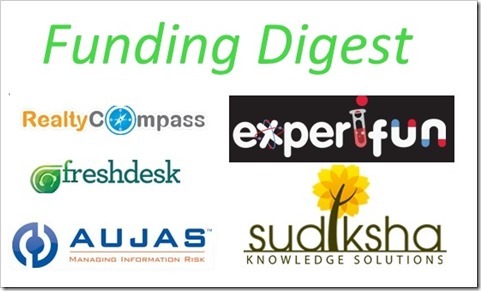 Funding Digest: Freshdesk, Experifun, Sudiksha, Aujas Networks, Realty Compass Raise Funds. Freshdesk had previously raised USD 1 million Series A from Accel partners in December 2011 and USD 5 million from Tiger Global and Accel Partners in April 2012. Freshdesk was founded by Girish Mathrubootham and Shan Krishnasamy in 2011 and the idea originated from a hacker News update about Zendesk increasing their prices. They currently serve over 10,000 and is one of the fastest growing company in customer support space. The funds will be utilized for technology upgradation and expansion of their global operations. Girish Gupta, CEO of Rajasthan Venture Capital Fund and Vikram Gupta of IvyCap Ventures will join the company’s board. Aujas was founded by Srinivas Rao in 2008 and incubated by IDG Ventures in their Entrepreneur in Residence program. Currently Aujas has its presence in North America, Middle East and India. Nearly half of company’s business comes from outside India. Two online education startups, Experifun and Sudiksha Knowledge Solutions have raised USD 75000 seed funding from Pearsons Affordable learning fund and Village Capital. Sudiksha is a social entrepreneurship initiative that aims at improving overall quality of educational standards at low costs. Sudiksha currently owns and manages 18 schools in Andhra Pradesh, out of which 12 are in Hyderabad and 6 in rural Andhra Pradesh. Experifun, is a Bangalore based education company founded by IIT/IIM Alumnis, who are focused on teaching science. Experifun create activities and experiments to help children learn science n more fun and engaging way. Chennai based property & real estate search engine startup – Realty Compass has raised angel funding from small early stage investment firm and clutch of HNIs, reports Techcircle. The funds will be utilized for product development and property data collection. Realty Compass was founded by Nimesh Bhandari and Sankara Srinivasan and currently has over 6000 project listing as per their website. Realty Compass plans to expand Mumbai, Delhi, Ahmedabad and Kolkata in next 3 months.